Last night I returned to Sabino Canyon along with friends. We began our walk right after sunset. Because of the threat of rain, we decided to avoid any creek crossings as well as the riparian area. Instead, we began walking the dirt road from the parking lot toward lower Sabino, then took the paved road across the Sabino Overlook and back towards the visitor center. 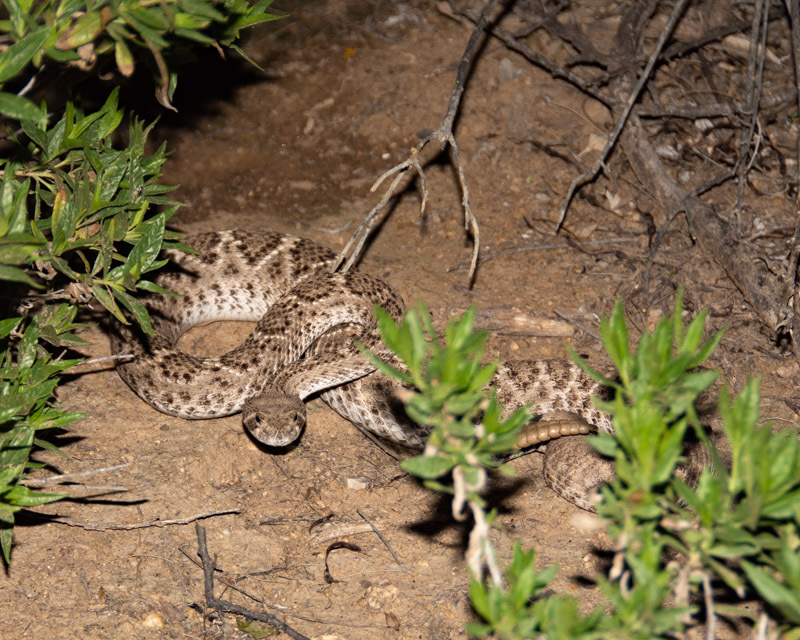 Surprisingly, there were very few toads out, but we did run across some pretty amazing sights anyway, most of which are duplicated all throughout the Foothills on most summer nights. Shortly up the dirt road, we met two sweaty runners who advised us to watch out because there was a rattlesnake across the trail up ahead. Naturally, we took that as a gift rather than as a warning. 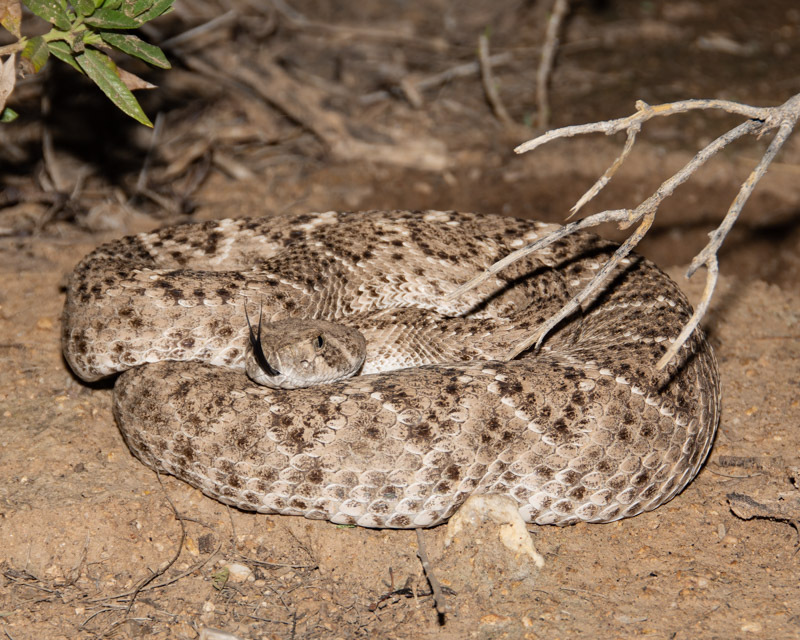 True enough, a small Western Diamondback Rattlesnake was waiting for us. It moved off the path and gathered itself, not quite coiling, just watching. It continued tasting the air to try to determine who we were. The snake’s tongue gathers the chemicals in the air and then transfers them by fitting the fork into the two holes of the Jacobson’s organ in the roof of the snake’s mouth. Those chemical compounds are then analyzed and messages sent to the snake’s brain let it know what animal might be near. The two characters in this dance circled each other carefully for a while. 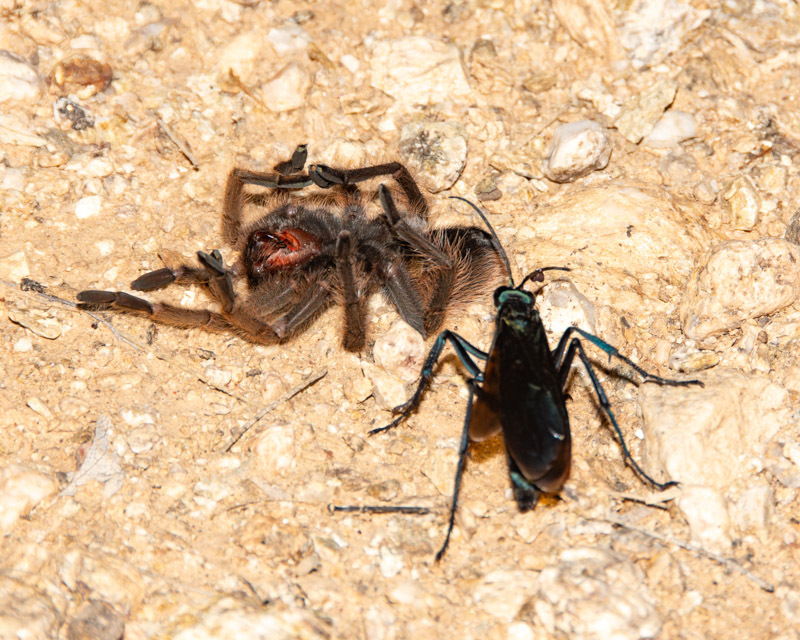 The tarantula was a small one and the pepsis wasp rather large. 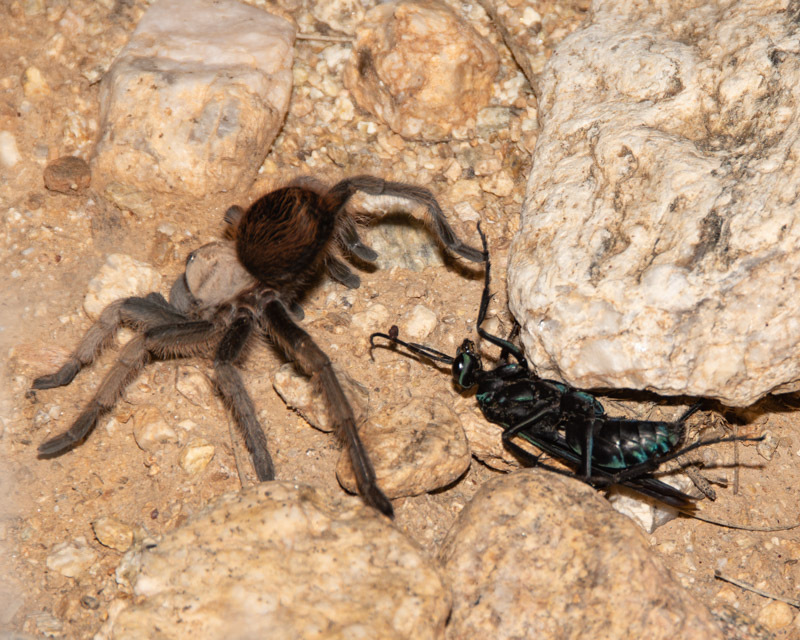 The wasp then tried to approach the spider while on its back. We weren’t sure what the strategy was, but that was the attack method. 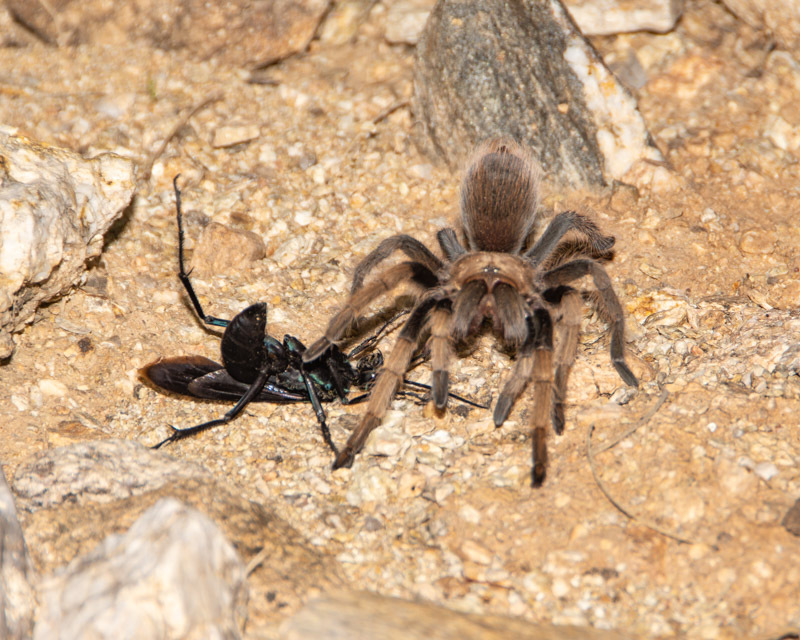 While the wasp was trying to attack from its back, the tarantula assumed a defensive position, its rear facing the predator and up in the air. This defense works with mammals who would be near that spot sniffing the spider. The spider would kick off the urticating hairs from the top of its abdomen into the nose, eyes, or mouth of its predator. These hairs are tipped with backward facing barbs which are very irritating and difficult to remove. Although that would work well if the predator were a coyote, or cat, or other mammal. It doesn’t look like that would really keep the spider safe from the wasp. 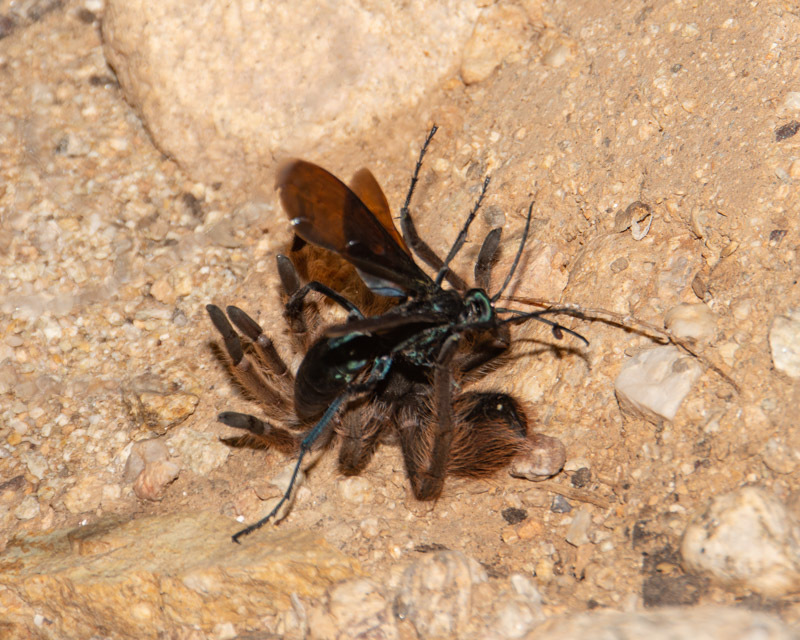 Both moved quite a bit as the Tarantula Hawk continued to circle the spider while on its back, and the spider continued to point its rear towards its predator. 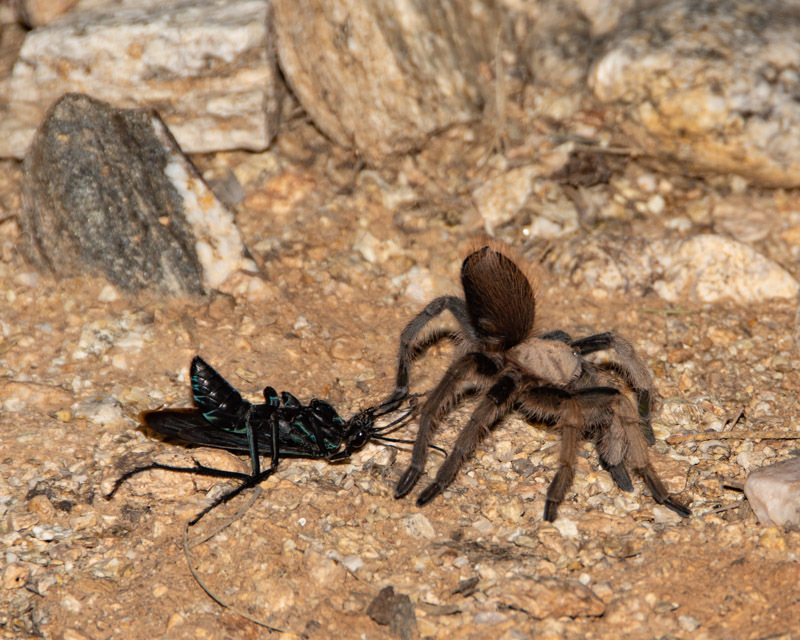 And the fight was over, the tarantula subdued. Feet up and fangs up spell Victory! 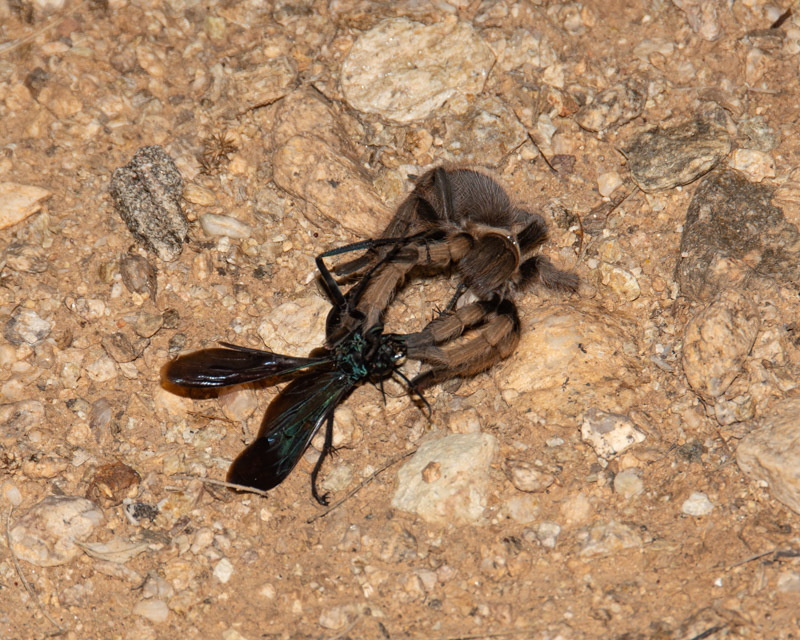 The wasp looked around for the spider’s nearby burrow and, when it didn’t find any, flew off either in search of a burrow or perhaps to find a site where it would dig a burrow and then drag the paralyzed spider to it. The spider lay still, although its legs would occasionally move slowly. 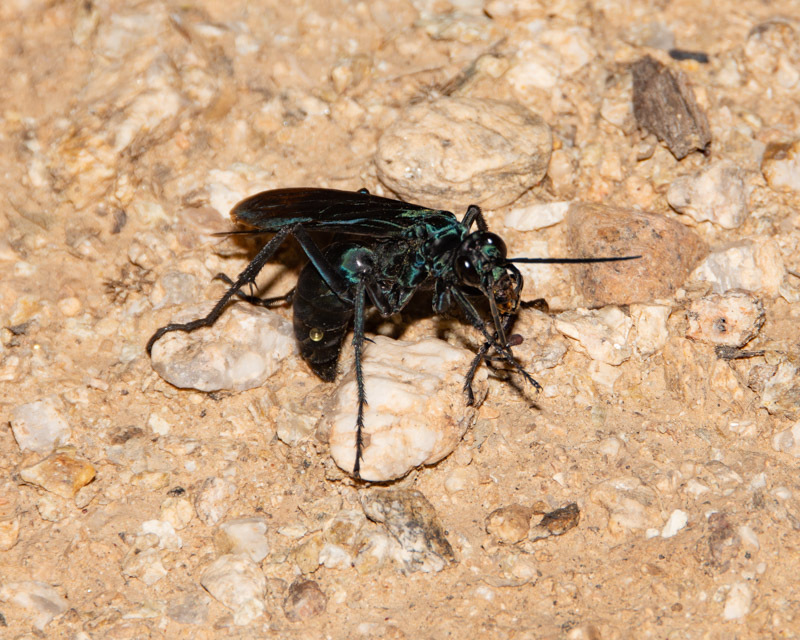 A closer look at the wasp shows that it may have sustained some kind of injury during the fight. I am curious about the drop of liquid on the abdomen of the wasp. After the wasp left the area, we did too. 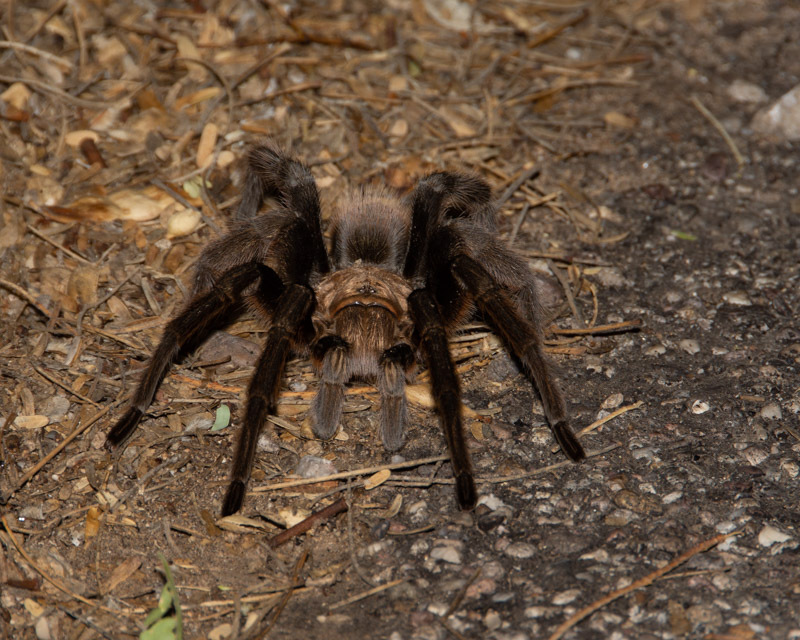 Later on along the road we came across another, larger tarantula waiting for prey. We saw it quickly grab a moth that ventured near. 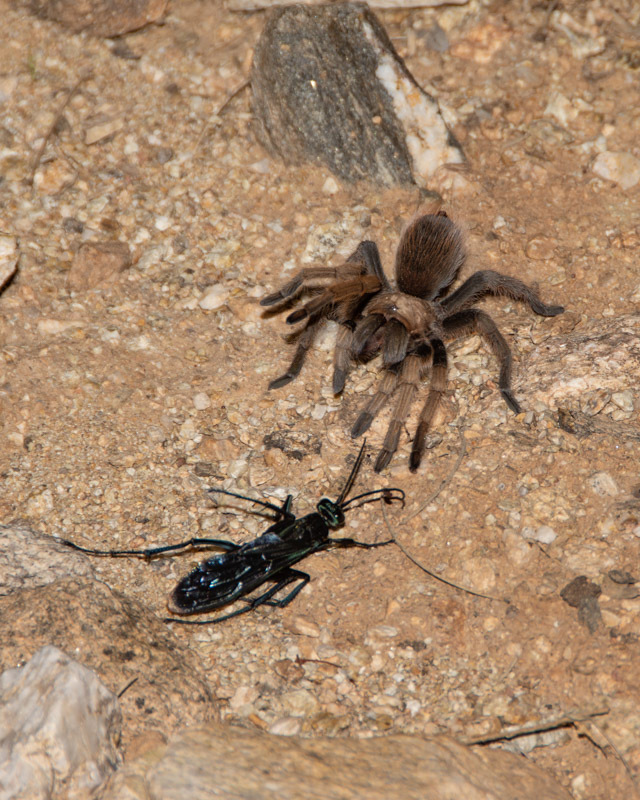 In this shot, the tarantula was waiting for prey to arrive. 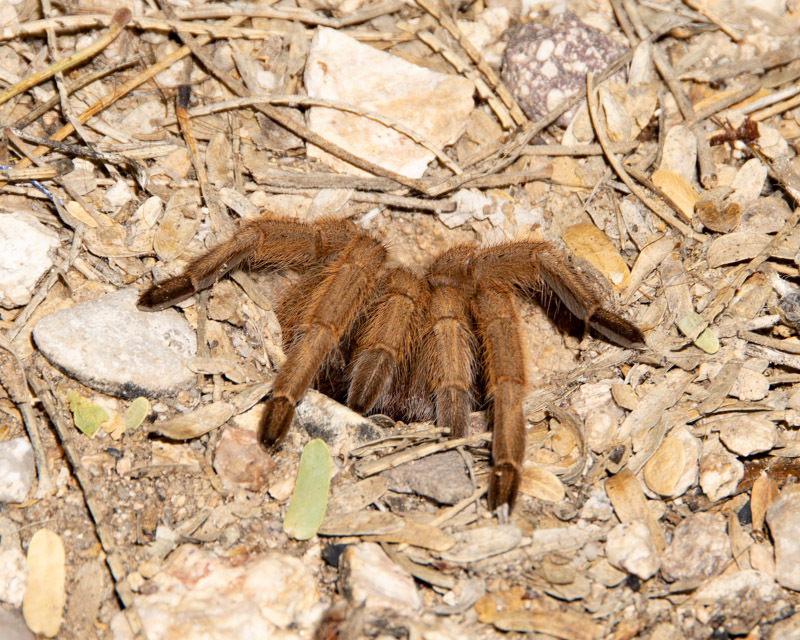 And we visited the female Arizona Blond that has been living near the Visitor Center for many years. She remains in or near her burrow and is very wary. Those “shorter” legs seen here and in the photo above are not actually legs. 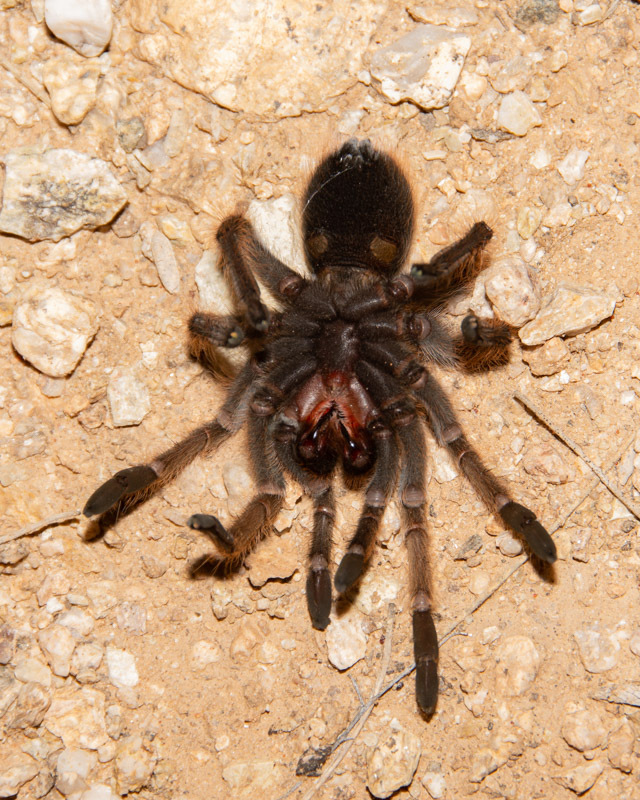 They are called pedipalps and are used like arms for the spider. It was a pretty exciting night at Sabino Canyon, and we didn’t get rained on!